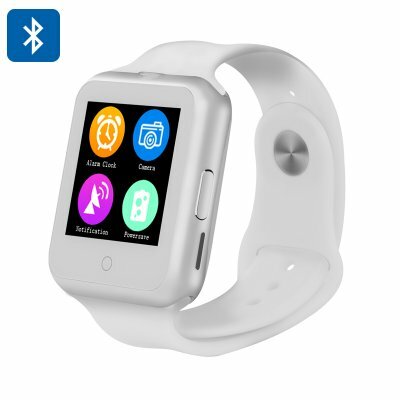 Successfully Added NO.1 D3 Smart Watch Phone - 1.44 Inch Touchscreen, MTK6261, Qud Band GSM, Heart Rate Monitor, Pedometer, Sleep Monitor (White) to your Shopping Cart. The No.1 D3 smart watch proves you don't have to spend a fortune to get great functionality in a smart watch. With the BTNotification app you can pair the watch to your phone or insert a GSM SIM card and use the watch as a wrist mounted phone. This watch and phone combo has a heart rate sensor that will detect your pulse and offer other related information such as ECG which is really neat. It does this by comparing your reading to a built in average and then supplies an approximate heart rate reading. You also get pedometer, calorie counter, sleep monitor, sedentary reminder and anti-lost functions as well as all the standard notifications of incoming calls and messages. The built in LED’s around the outer edge of the smart watch will light up creating a very visual notification when you receive incoming calls so your need never miss an important call again. You can also set a vibration alert as a more discreet reminder for when you’re in meetings or don't want to be disturbed. When synced to your phone via the BTNotification app you can take remote control of your Smartphone’s camera as well as access contacts information to make and receive calls. But should you want to leave your phone at home the D3 smart watch will let you as it has quad band GSM support. You will also be able to access the pedometer, sleep monitor and sedentary reminder making the D3 a great fitness trainer and monitor for your sporting activities. With a micro SD card slot supporting up to 16GB of removable storage you can load up on hours of motivational tracks for listening to as you work out. Its sleek modern design with scratch resistant body and comfortable tuber strap will keep it securely in place and safe as you go through your daily activities making it as fashionable as it is comfortable. The NO.1 D3 Smart Watch Phone comes with a 12 months warranty. Brought to you by the leader in wholesale smart watches.. The heart rate sensor monitor on this product isn’t for professional athletes, it is more used for overall heart-rate guidance.